A few months ago, our hockey team tried to eat at Bo Laksa's Bubbles and Bits to no avail. They had decided to close early and we were left with a dark restaurant and locked door. Undeterred, we tried again and well, another epic fail. Okay, lemme do this the right way: Tried to eat @BoLaksaKing #epicfail. You see, the place is small and trying to find a table for 6 on a Friday night was not in the cards. Fine. Maybe the next time we'll be 3rd time lucky? Probably not. Anyways, we left in search for other eats. 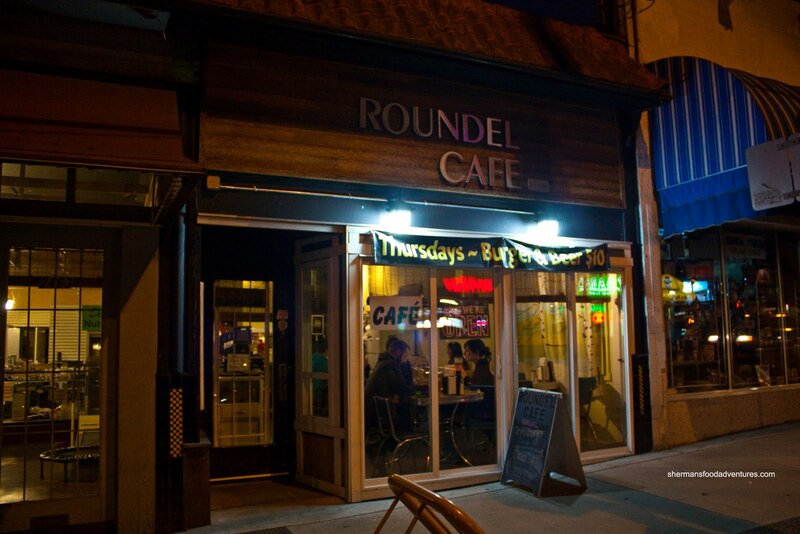 Originally, we were going to stroll down one block to Tentatsu when suddenly, we spotted Roundel Cafe across the street. Hey, let's go there instead! We could do Japanese any other time; but a diner? Heck ya! In fact, an ol' skool counter with stationary stools and booth seating welcomed us as we walked in. This is a diner alright. So what does one order in a diner? 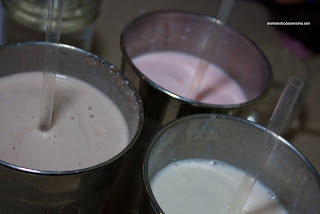 Milkshakes of course! From the bottom clockwise, we have English Toffee, Choco-Mint and Strawberry. I gave Milhouse's Choco-Mint a try and it was pretty good. I didn't get much in the way of mint but the shake was creamy and not overly sweet. Since it was served straight out of the metal mixing cup, there was a lot of it. I liked that there was a large selection of flavours too. In order to maximize my food options, Sweet Tooth and I decided to share 2 items staring with the Chicken Burrito. 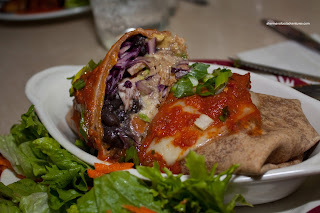 The darn thing was really substantial in size and stuffed with tender chicken, black beans, brown rice, red cabbage and cheese in a whole wheat tortilla topped with more cheese and salsa. Now, I'm not a huge fan of burritos and this one didn't necessarily change my mind; yet it was solid. Lots of good quality ingredients and it was filling. Personally, I would've liked more flavour and spice; but that's just me. The second dish was the Mango Brie Quesadilla. 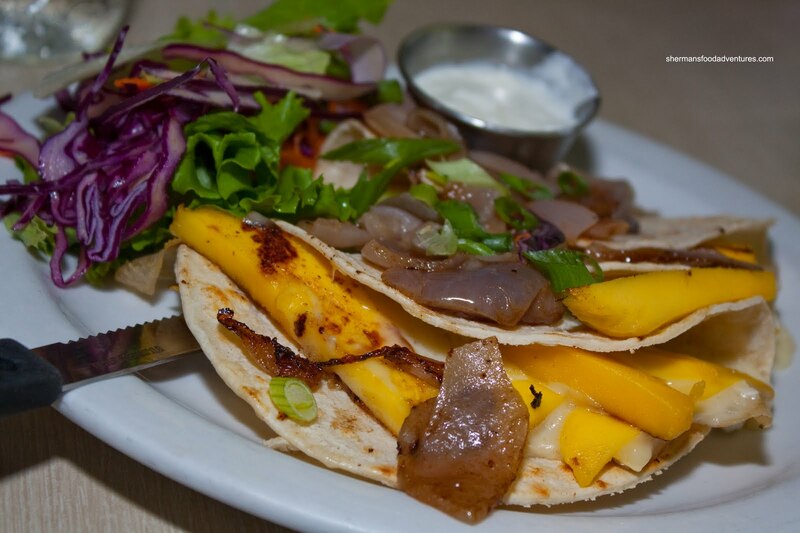 As the name suggests, it is mango and brie within a corn tortilla topped with red and green onions. Yogurt dip was served on the side. I wanted to like this dish; yet in the end, it didn't really deliver. First, the tortilla was too dry and chewy. Second, there was just not enough flavour. The mango was quite mild and I really didn't get a lot of brie flavour. If this was a dessert, it might've worked better. 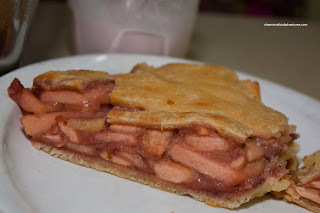 And on the topic of dessert, Gadget Girl's daughter had the homemade Apple Strawberry Pie. For a little girl, it was quite a substantial pie for her to eat, so I helped myself to some... It was tart and thick (? ), not sure if that was the right adjective. 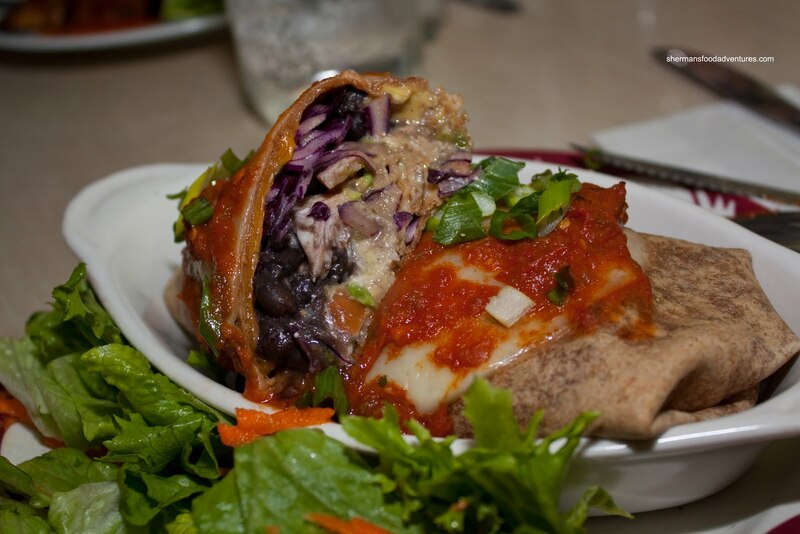 Hence, the entire thing was a bit dense including the crust. There was a lack of strawberry taste; but we could all see it. With that in mind, the pie was still pretty decent and we appreciated that they made it in-house. It probably could've been better a la mode. As for Gadget Girl herself, she inexplicably ordered the Tofu Burger. Never being the vegetarian, that was quite odd. Well, I guess it was never going to be a good fit because she was quite "meh" about the burger. 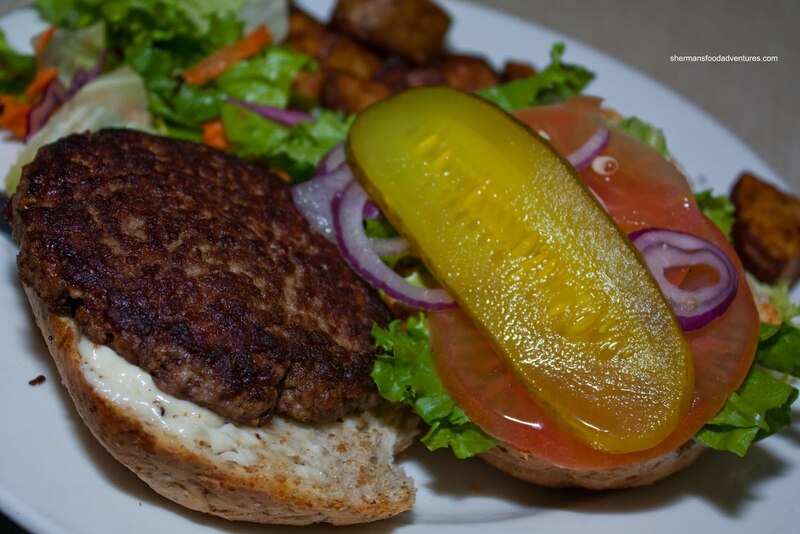 The patty was a bit crumbly and dry; but hey, we are biased. The good thing about it was the price, it was only $6.00 being the daily special. Now Polka King finally joined us for a meal after a long absence. Maybe Polka Dot actually allowed him to get out of the house for once. Being such, he ordered a Beef Burger. Yah, he's a man, at least for tonight. 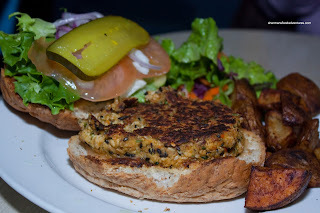 I can hear Polka Dot crack that whip already... Much like the tofu burger, it came with a whole wheat bun (which is a good thing) and all the accompaniments were fresh and vibrant. The burger patty was a tad dry; yet not oily. Polka King remarked it was a typical burger. He did like the price though (which is a trend with all the items on the menu). Milhouse didn't have a salad this time and it was truly surprising. After all, he's been trying to look after his girlish figure. 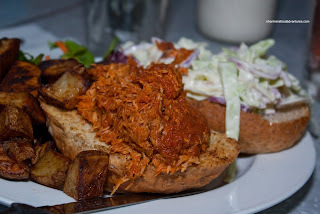 Deviating from his diet, he had the Slow Cooked Chili Chicken Burger. In reality, it was more of a pulled chicken sandwich than a burger. The spicy chili tomato sauce was quite flavourful while the chicken was surprisingly moist. A good amount of thick-cut crunchy coleslaw added a nice textural contrast. 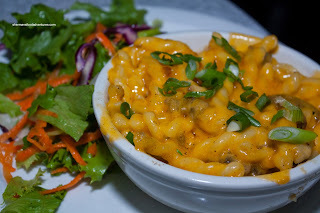 Before ordering the burrito, I had my eye on the Ham Hock Mac 'n Cheese; but since Emilicious decided on the Vegetarian Mac 'n Cheese, I decided not to do a duplicate. Now it wasn't exactly mac 'n cheese in the literal sense. Rather it was fusili and cheese. No matter, unless they are using rigatoni, any other pasta should work. As you can see, it was very cheesy. Indeed it was cheesy; yet curiously not creamy. The noodles were cooked nicely though. Not a bad attempt, I'm sure the ham hock version would be much more flavourful. oh, I have to agree with your son, I just love a good mac 'n cheese.... and a good grilled cheese..... those are both of my comfort foods and no matter how sophisticated my palate may become, I think I'll always get excited when I see a good review for either of them. 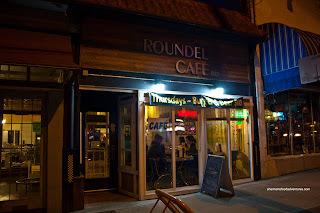 i too went to roundel cafe after a failed attempt at BO Kings, it closed at three in the afternoon, another time it was closed due to a catering event, third time closed due to a kitchen problem, i've given up on Bo, his food is good but the service is spotty, try Seri Malaysia instead, just up the street and pretty good. Yup, Grilled Cheese and Mac n Cheese are 2 of my favs too. But to get a good one is more difficult that it appears in this town. Yes, I've been meaning to try Seri Malaysia. Thanks for reminding me!